Responding to the derogatory remark, Naresh Chauchan, Congress spokesperson for Himachal Pradesh, said the party is consulting its legal cell and may file a complaint soon. File photo of Himachal Pradesh BJP chief Satpal Singh Satti. New Delhi: Campaigning for general elections hit a new low on Monday with Himachal Pradesh BJP chief Satpal Singh Satti hurling an expletive at Congress chief Rahul Gandhi for his ‘Chowkidar Chor Hai’ remark. Speaking at a public event in Baddi town of the Shimla Lok Sabha constituency, Satti said that if Rahul Gandhi can call Prime Minister Narendra Modi -- who calls himself country’s chowkidar (watchman) -- a thief, he is also free to abuse him. "Rahul Gandhi is out on bail, his mother is out on bail, his brother-in-law is out on bail, and yet he calls the Prime Minister a thief. A Punjabi man asked me to convey this to you with a heavy heart, and that inspires me to tell you this. If PM Modi is a thief, then you are a m********," he was heard saying in a video widely circulated on social media. Responding to the slur, Naresh Chauchan, Congress spokesperson for the state, said his party is consulting its legal cell and may soon file a complaint. "We are taking the opinion of our legal cell. Subsequently, we may file a formal complaint against him with the Election Commission," Chauhan said. 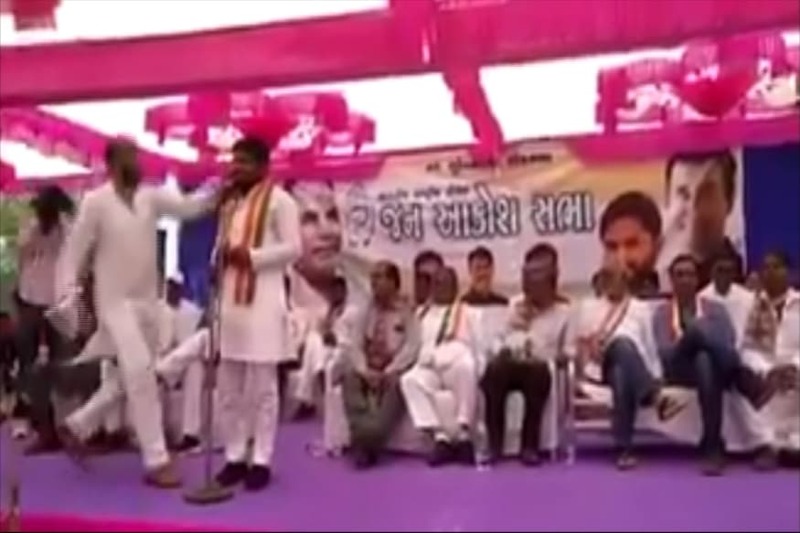 State Congress chief Kuldeep Rathore also reacted sharply to the remark, saying such abusive language was not expected from a senior politician. The statement drew a strong reaction from Congress spokesperson Priyanka Chaturvedi as well, who took a jibe at Union minister Sushma Swaraj for comparing mythological character Bhishma Pitahmah and SP founder Mulayam Singh Yadav, asking him to respond to the ‘khaki underwear’ comment by his party leader Azam Khan. “Just hear the sanskaari Bhajapai. Hello Sushma Swaraj ji, I look forward to your condemnation and you asking your party to seek suitable action. PS: Don’t let them act like Dhritashtra or Gandhari in this case,” Chaturvedi tweeted. Just hear the sanskaari Bhajapai. Hello @SushmaSwaraj ji, I look forward to your condemnation and you asking your party to seek suitable action. While Modi has declared himself a chowkidar, the Congress has been trying to corner him over the alleged irregularities in the Rafale fighter jet deal and has countered his claim with ‘Chowkidar Chor Hai’ jibe.